It’s that time of year again. That bittersweet period when you realise that it’s Paris-Roubaix but also the end of the cobbled classics for another year. With a spring classics season that will go down as one of the best, the Queen of the Classics could top things off in spectacular style. Clocking in at 257km, this year’s Hell of the North takes in twenty-nine sectors of pave, which make up 55km of the race, 2.2km more than last year. This is a race where the body and the mind take a beating. Power and skill are needed to fly over the cobbles, but also focus is key in order to cope with all that the race can throw at you. Like most spring classics, the first 50-100km are nothing more than a warm-up for the main event later on, and Paris-Roubaix is no different. The first sectors of pave are reached after 112km, with Briastre and Solesmes (the first time these sectors have been included in the race for thirty years). However, these will have little impact on the outcome of the race. The real fireworks will begin when the race hits the 161km mark which heralds the start of Trouée d’Arenberg. The 2.2km stretch of pavé through the Arenberg forest is one the most historic roads in cycling. It is brutal and the fight for position at the front will be fierce, as significant time can be lost if you are caught up in a crash and the melee that ensues through the trees. The longest stretch of pave comes shortly after at 174km with the 3.7km long Wandignies-Hamage. Following this we have the two big sectors of the race, the Mons-en-Pévèle after 208km, which is in a torrid condition, and the Carrefour de l’Arbre, arguably more feared than the Trouée d’Arenberg, the condition of the stones is again poor, but it’s the corners that make this sector one of the hardest. 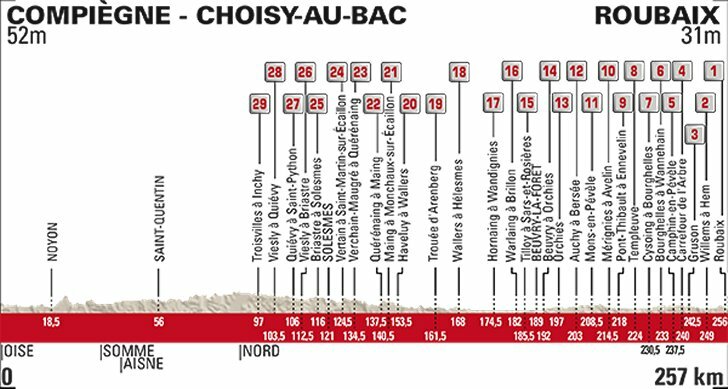 After this there are only 15kms remaining, so this will likely be the last chance for any rider wanting to make a break on the pave before they reach the velodrome in Roubaix, as the remaining sectors aren’t severe. The race ends with one of two scenarios. Either a solo rider of reduced bunch will enter the Velodrome. If it’s the former, and he has enough of a gap, he can soak up the atmosphere of one the most hallowed finishes in cycling. If it’s the latter, then we are in for a very tired game of cat and mouse, in what must be the most tired looking sprint finish in the sport. In the run up to this race there is one rider on everyone’s lips. Tom Boonen. This is the last time that the four-time winner will ride over the cobbles, the last time he will ride in a professional race and the final chance for him to become a record-breaking five times winner of Paris-Roubaix. He was second last year and has looked to be peaking his form for his final race to perfection. His long-time rival Fabian Cancellara didn’t get his fairytale farewell in the Roubaix Velodrome, but we think Boonen has a better shot. Not least because of the team he has around him. Niki Terpstra, winner in 2014, Zdenek Stybar, Yves Lampaert and Matteo Trentin could all be leaders for this race if they were in another team but they will all ride for Boonen and that, coupled with the vast experience that he has in this race, could see the whole of Belgium rejoice on Sunday. However, there is another Belgium who had also been eyeing a cobbled monument or two before he hit the stones last week at Flanders. Greg Van Avermaet is the in-form rider on the cobble stones at the moment after his wins at Omloop Het Nieuwsblad, E3 Harelbeke and Gent-Wevelgem. Much has been written about the incident that saw Neisen, Sagan and him collide, then hit the deck. Our view is that if you choose to ride in the gutter and up aginst the barrier or choose to follow the wheel of a rider that has decided to take that line, then you run the risk of catching the barrier or a spectator and this is exactly what happened. Ride the cobbles, that’s what they’re there for! That said, Van Avermaet made a valiant attempt to try and pull back Gilbert but he had to settle for second. With the likes of Oss, Drucker and Quinziato to support him until the final stages, he is the in form favourite. The main protagonist in that Flanders crash was Peter Sagan. Once again he is one of the riders to watch in this race, but he doesn’t command the same favourite tag as he did at the start of the year. His in-race tactics have let him down and it’s only recently that we’ve seen him employ the “I’m not working for you boy” tactic in the final phases of races. He needs to stick to this, as his Bora-Hans Grothe team aren’t equipped like other teams. So once again, if he wants to win this race, he’ll need to do so on his own. Paris-Roubaix is a race based around luck and seizing your opportunity. That’s exactly what Matthew Haymen did last year. He is lining up for his sixteenth Roubaix as defending champion, but will likely be working for his teammates Jens Keukeleire and Luke Durbridge. Keukeleire missed Flanders through illness, so will be the fresher of the two, but both have been in great form over the cobbles this season and both have this down as the race that is most suited to them, Durbridge especially with his time trialing ability. Both are darkhorses, but it wouldn’t be a surprise to see them roll into the Velodrome in the front group. John Degenkolb didn’t get the chance to defend his 2015 title and he has said that this race is his main goal for the season. He has looked to have got back to the sort of form that he had in 2015 where he won the San Remo, Roubaix double and he has a strong team around him with the likes of Stuyven, Thuens and Peterson, who could all be called upon as backup if the German falters. 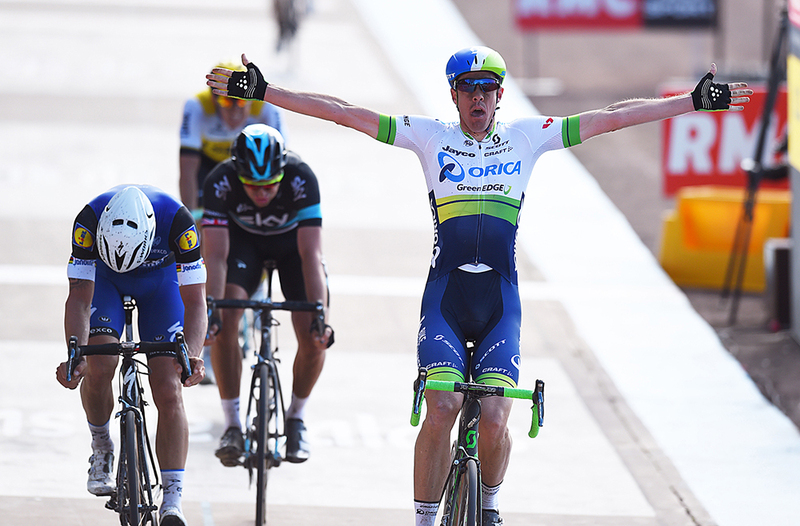 Sky, like a few other big teams, have had a cobbled classics season to forget. Luke Rowe has been mixing it in the main moves but has suffered from bad luck at the crucial moments. At the start of the year, it was thought that he would target Flanders and Ian Stannard would target Roubaix, however Stannard, who was third in 2016, hasn’t shown great form, so once again team leadership will likely be confirmed out on the road. Alexander Kristoff has also had a classic season to forget and we would argue that it’s his teammate, Tony Martin that would be getting the nod for this race. The German will have moved from Quickstep in order to get his shot at these kinds of races, so we expect to see him go for a win similar to Boonen in 2012, from a long way out, as he’ll likely be outsprinted in the velodrome. Other riders to look out for are Oliver Naeson who has shown amazing form until Flanders and will want to bounce back in the last cobbled race. Edvald Boasson Hagan has always looked like a perfect Roubaix winner, but hasn’t managed it yet, he was fifth last year and we’d expect the same again this year. Dylan Van Baarle will be leading the Cannondale team in the absence of Vanmarcke and Phinney, he really stepped up at Flanders and apart from Gent-Wevelgem he has finished in the top ten in the Belgium races in March. Finally, our real darkhorse pick is Sylvain Chavanel. He was ninth at Flanders and also looked very nippy at De Panne. He also has the experience to draw upon, which is so important at this race. Our Pick: Come on, there is only one surely? Tom Boonen will overtake Roger De Vlaeminck to become the only five-time winner of Paris-Roubaix. Becuase fairly tales always come true… don’t they?! Come on Sagan! Bring it home for me.